Ideally, we’d all like to do just that (go green and save money), but the relationship between saving the earth and saving a few dollars is one that defines the idea of “taking things slowly.” While many industries are working hard to make strides so that all parties are happy, the changes usually don’t happen quickly enough. Of course, business owners would prefer to cut costs while cutting out non-green practices, but cost savings usually emerge victorious, in a way serving up the old adage it’s not you, it’s me to the other, planet-friendly choice. Leave it to Epson to find a way to marry the environmentally conscious with the budget-watchers. Long known as a company committed to both reducing costs and meeting environmental goals, Epson has a long history of achievements in protecting the environment and is now one of the leading environmental companies in the world—it’s no wonder that this company would be the one to develop a cost-saving, advanced technology that automatically saves paper. Small business owners always look for ways to run an efficient, economical operation while still offering customers the best quality products. 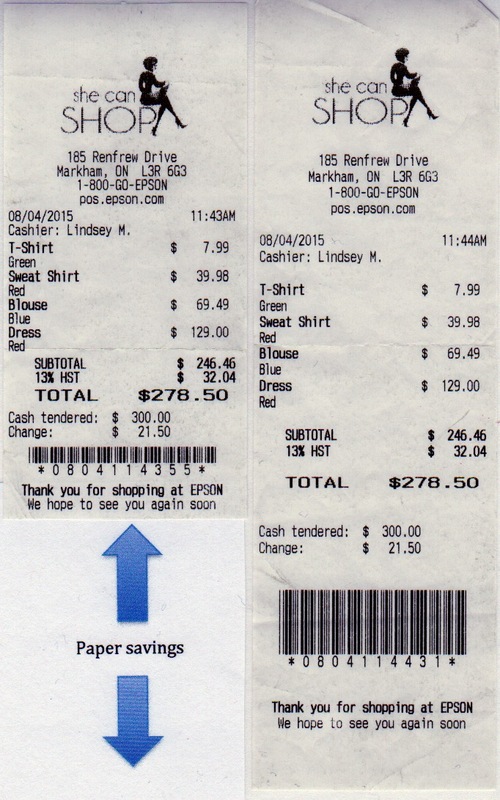 Sometimes it pays to cut costs on the items that do not really matter in the end, but what about your receipts? How could you even go about doing that without comprising the information contained on said receipts? Receipts are valuable to both you and your customers—how else would customers be able to return or exchange purchases or have a record of payment? The truth is this: there’s a way to use less receipt paper and still manage to include all pertinent information on a receipt of sale: the Epson TM-T88V Printer. The printer comes with a built-in setting that allows you to save receipt paper. Here’s how it works: the printer eliminates useless white space above and below your text and graphics (including margins) and thus decreases the overall size of your receipts without decreasing the readability of the receipt. The quality and readability of the information remains intact because with this paper-saving setting, the size of your graphics and font doesn’t change (unlike other so-called space-saving printers that condense and decrease text and images). The TM-T88V was the first POS thermal printer to be ENERGY STAR qualified and is the most energy efficient in its class. Epson conducted power consumption tests on single-station printers sold in the United States [including Epson, Star, IBM, NCR, Citizen, Bixolon, and Ithaca] and found that the TM-T88V used between 13% and 89% less power than other printers in its class did. The printer also reduces the creation of carbon dioxide emissions over the life of the printer. As far as printers go, this printer offer the greenest option available to date.